Welcome to A Special Christmas Soiree!! 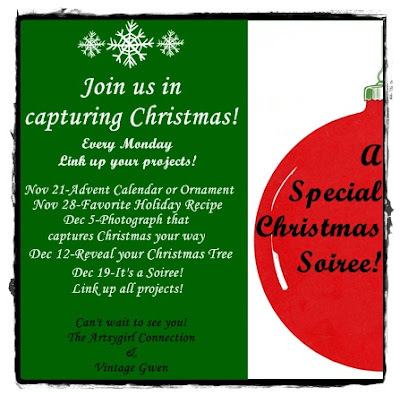 I hope you're ready to join the fun and help The ArtsyGirl Connection and I capture Christmas!! Today's project is all about ornaments or advent calendars! It was very easy to make! Several of these would be cute on a small tree in the kitchen! As far as an advent...I was seriously thinking about doing one with Lil' Hunkie but after explaining what it was to my husband we decided it might be too much for him right now. But I'm still wanting to do something. I was so excited to find this!! I have some vintagey Christmas decor that this is going to go awesome with and now I have a countdown to do with Lil' Hunkie! Yippee! Ok it's your turn!! Whatcha got? I can't wait to see!! And be sure and go check out what Marilyn of The ArtsyGirl Connection did today!! It's very creative!! I can't wait to start linking up! I have a few Christmas decor tutorials coming up! I love what you've made so far! Thanks for the fun party Jennifer! Off to check off Marilyn's place now.